Hardy to 15-20 degrees F.
Large, dramatic shrub makes broad thickets by means of its radiating, sometimes rather invasive rhizomes. The stems are quite thick. They rise 6-12 feet and carry arching, palm-like leaves up to 2 feet long. These are colored a chalky blue on their upper surface, paler and greener beneath. 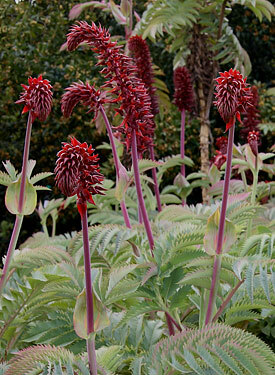 The flower spikes are sometimes over 2 feet long, with flowers about 1 inch long and an odd, brownish red in color. Orioles and hummingbirds sometimes visit in spring to sip on the large quantities of dark nectar in the flowers. Honey bush will thrive in sun or light shade, given moderate watering. The tops are damaged at 20-25 degrees F., but their substantial rhizomes resprout after harder freezes.